Cobblestone Paving from J.H. Wagner & Sons. The texture and shape of Cobblestone Paving add interest to any path, driveway, garden edge, border or kerb area. Cobblestones may have a variety of surface finishes including split, exfoliated face with split edges and sawn or split backs. With options of individual pieces or in ready to install sheet layout this is a versatile paving option. Cobblestones on a sheet backing save time and cost in installation and various patterns including radiating fans provide even more options for the Cobblestone project. 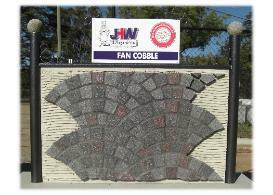 Even the grout colour can influence the appearance of your Cobblestone Paving, the JHW display panels demonstrate coloured grout and grey cement grout finishes. 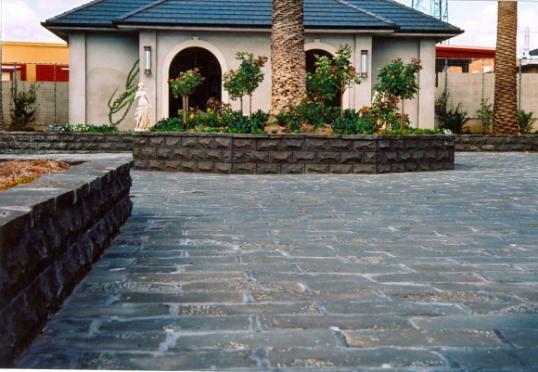 As a feature band across a concrete path or driveway, Cobblestone Paving is the perfect solution to avoid bland appearance and can easily create a transition area between different materials. Above Left - Did you know that you can cut cobblestone sheets into strips for laying a garden edge / mower strip very easily and usually without any cutting!